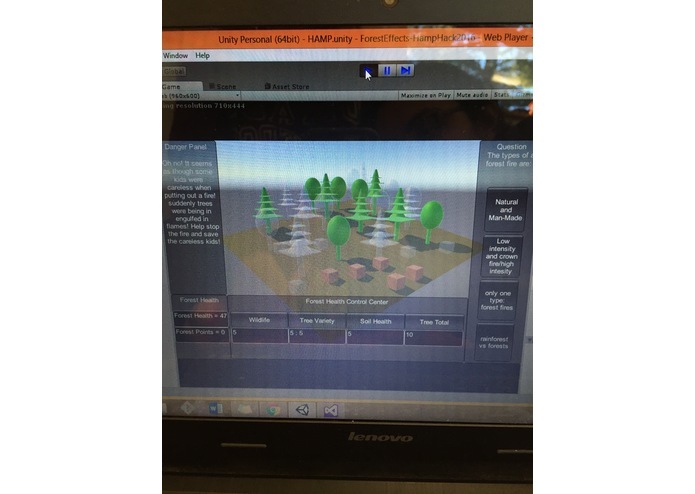 A game that allows kids to maintain a forest while learning about the impacts of human interaction on the ecosystem. Our inspiration for this project came over a run-of-the mill Monday lunch. The 3 of us were discussing what we wanted to build for this hackathon and each member had one major thing they wanted to work on. 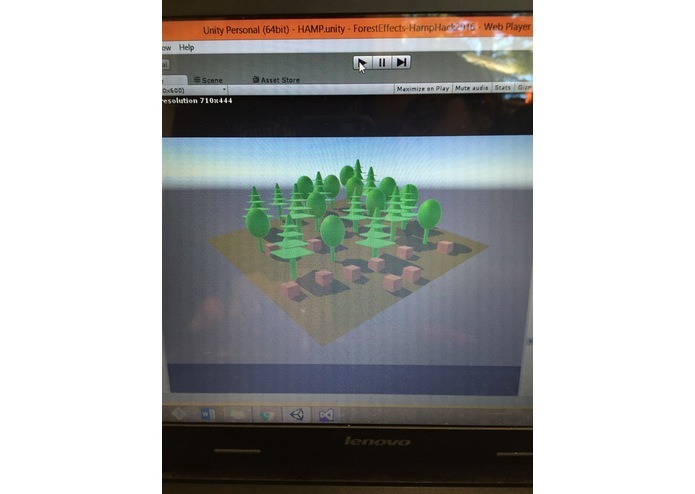 One girl wanted to create something people could use, another wanted to create a game and the last wanted to do something related to education. 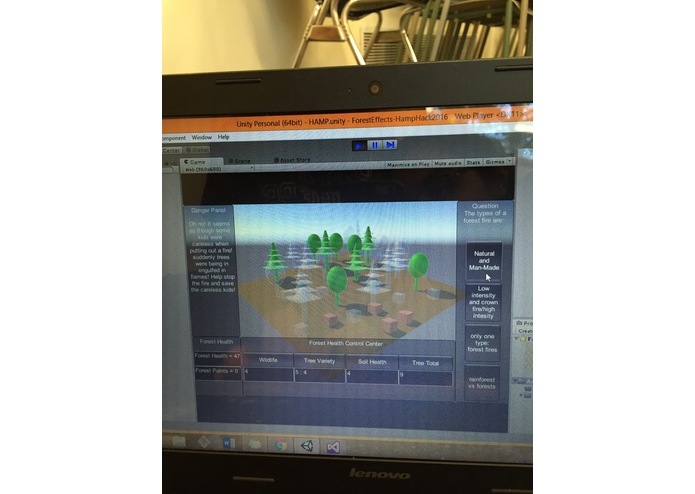 The initial idea was to create 3D-based interactive game that allowed kids to learn about physics. After arriving at the hackathon, we opted to change our subject to environmental awareness to relate more directly to the hackathon's themes. This game is similar in structure to Roller Coaster Tycoon(a popular computer game that allows users to build and manage a theme park). Players are given a piece of forest and are instructed to maintain its health (displayed in a corner bar). 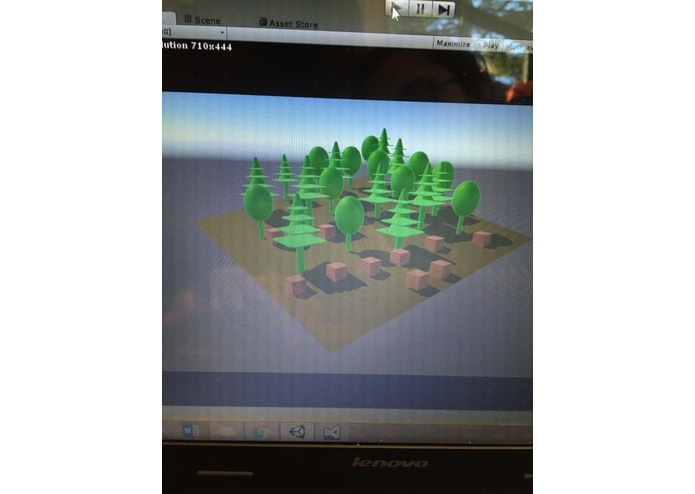 The forest contains 2 types of trees (pines and oaks) and deer (depicted by the cubes). The player's forest is threatened by man-made and natural disasters and the player can help avert these disasters by answering multiple choice questions. Correct answers stop the calamity and give the players points to help develop their forests into an ecologically healthy environment. Incorrect answers cause the disaster to remain and thus. decrement the health of the environment. The player wins the game when their health percentage reaches 100% and they lose when the percentage reaches 0%. The project was largely built with the help of the Unity3D Game Development Platform. Our scripting language of choice was C# because it has many similarities to Java, a language we are all comfortable with. The 2 Windows' members wrote their scripts on the VisualStudio IDE and the 1 OSX member coded with the aid of the MonoDevelopment IDE. Perhaps out biggest challenge was climbing over the learning curve. None of us have had any experience with game development or the languages we used. Our major breakthroughs did not come until the later part of the hackathon because we were spending out so much time trying to fix the most trivial issues. One main challenge we ran into was object disappearance. The member who chose to create the graphics spent a lot of time trying to determine the best way to make objects 'disappear' when forest health decreased. Another major challenge we dealt with was formatting Unity's GUI options. The buttons didn't always format the way we wanted them to. Our game requires many buttons and clicks so making sure every item was properly connected to the required items involved a lot of careful coding and, in some cases, lots of debugging. The randomized timer was also not easy to work with. One member spent several hours trying to figure how to program and where to place the randomization in order to create questions to gain points. Lastly, we found integration of individual components to be difficult. When we tried to push our copies of the project to GitHub (an attempt at simple integration), the game components wouldn't get copied over along with the scripts. We eventually wound up resolving this issue the old-fashioned way: by copying and pasting code directly into one member's machine. Code was transmitted over USB. There were plenty of challenges, but we found some way or another around them. We are mostly proud of climbing over the learning curve. Our game, though perhaps not the most technically or artistically complex game, it is still one easy to maneuver with working components and 3D images that make sense. Each member is also proud of the individual challenges she resolved in her portion of the code. Whether we were succeeding in overcoming graphics issues or randomized timer issues, each girl had her own reasons to feel accomplished throughout the course of this hackathon. 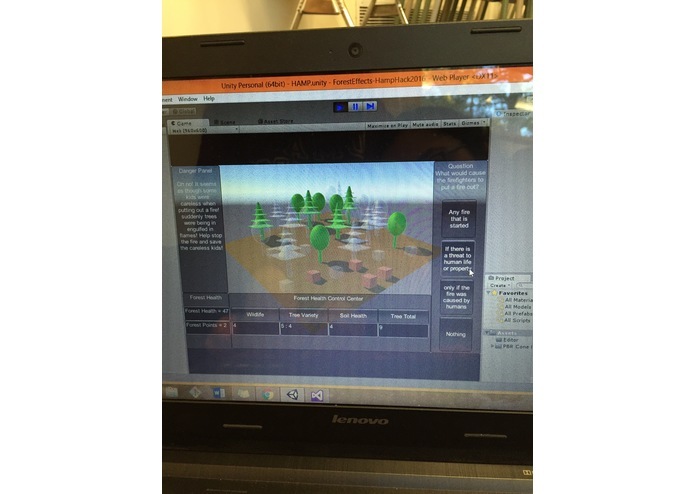 Along with learning how to use a new platform, a new scripting language and new IDES, we also learned about different environmental issues and how to effectively code in a very strict time frame. We are interested in developing the forest environment to display more environmental effects on the forest as a cause by humans. We would like to develop the overall graphics and plot of the game.